I have a new pet peeve: alarms going off in the early morning hours, on an overnight train. After successfully ignoring the “beep beep,” “buh deep, buh deep,” and “eeeee, eeeee, eeeee” of several people’s alarms, I opened my eyes to see what time it was: 7:00am. New pet peeve revised: alarms going off any time before 8:30am on an overnight train. Ultimately, it was good to be awake to watch the sunrise as we pulled into the Chuchill station. We packed up our carry-on gear which had spread across 4 seats, an overhead bin, and behind 2 other seats, during the course of the 2-day journey from Winnipeg to Churchill. After quickly downing a couple cups of coffee, we bundled up in our warmer gear and snow boots, loaded our luggage into a van, and headed to the place we’ll be calling “home” for the next several days. I’ll tell you more about that later. We dropped our luggage off in our rooms, received a short “Orientation and Bear Safety” lecture and then quickly went out to look for bears. Chuck Jonkel, the biologist leading us, is highly intuitive. I’ve witnessed Chuck in action for 3 years. Once everyone is settled on the bus, Frank, who is more than just a bus driver, turns to Chuck and asks, “Where do you wanna go?” Chuck kind of tilts his nose up, similar to the way polar bears do when they smell a potential source of food, and seems to “listen” for where he thinks the bears will be. “Let’s head up to. . . ” – it doesn’t really matter what location Chuck selects, 9 times out of 10, we’ll see at least one bear when we get there. Today was a bit unusual though. The visibility was low due to the weather and we drove around for a while without seeing any bears. “I haven’t seen a Snowy Owl in years. . . at least 3 years. . . that’s way too long,” Chuck said to Frank. “Look! Chuck!! There’s one right there — a Snowy Owl!” Frank replied, emphatically pointing out the window. “Can you start talking about how nice it would be to see a polar bear? !” I said to Chuck, trying to get him to use his psychic powers to guide us to the bears. Can you find the Snowy Owl in this picture? This is the first time I’ve seen a Snowy Owl in its natural habitat and it was spectacular. When Frank first noticed it, the owl was in flight, heading toward some rocks. It gracefully landed on the rocks and some naturalists (there’s an “ist” for everything) traveling with us set up spotting scopes so we could see the owl clearly. 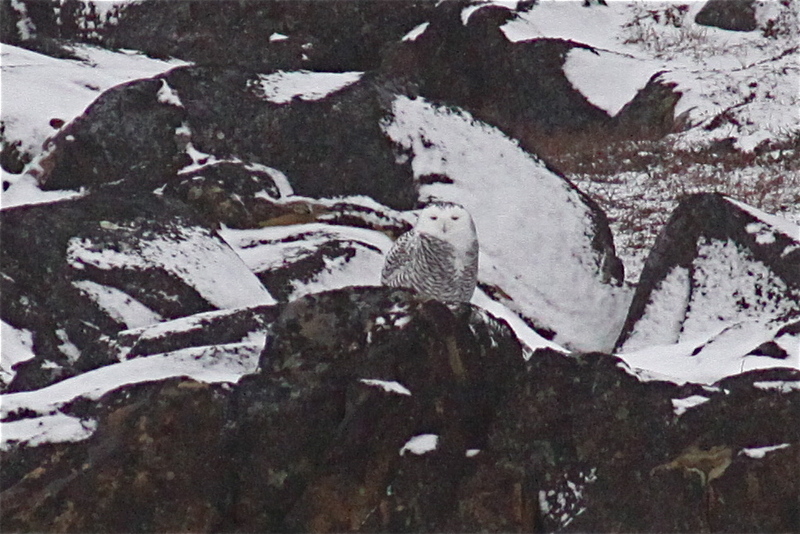 With the naturalists’ help locating the owl camouflaged among the rocks, I was able to capture the picture to the left. The Snowy Owl sat on the rocks, majestically, somewhat smugly, as if to say, “they don’t call me ‘wise’ for nothing.” Owls definitely know something we don’t know. There’s an uneventful portion of the day when we headed back to the Center to get lunch. I’m only mentioning it here because people on this trip are following this blog and they WILL call me out if I write about the day as if it happened in one long chunk as opposed to multiple, smaller blocks of time. But nothing exciting happened during lunch so, we move on. . .
We sat and watched the bears for a little while and then headed up the road a ways. We didn’t get too far before we pulled over again because someone, who was not Chuck, yelled “Bear!” when she saw a block of ice or snow-covered tree. It’s ok, it happens. While we were pulled over on the side of the road, willing the block of ice to materialize into an actual polar bear, a spontaneous Q&A broke out. Chuck is responsible for devising many of the polar bear research tactics and is one of the most renowned polar bear biologists in the world. He is a walking encyclopedia, but when he speaks he’s more like a grandfather you wish you had – “that crazy ol’ guy” with stories about helicopter crashes and fighting off a polar bear attack in Arctic waters. You could sit and listen to Chuck tell stories for hours and I hope you have the chance to do that sometime. The Q&A concluded as people started requesting a bathroom break, and of course, a trip to the one liquor store in town. I always say you can tell what kind of trip it’s going to be when you see how many people get off the bus during that first annual stop at the liquor store in Churchill. “Well, that’s one good thing — at least if we get stranded, we’ve got our wine!” Jeremy, who traveled all the way from the UK to drink wine in the Arctic, exclaimed as we drove back to the Center for dinner. Yes, that is one good thing. . .
More bears – and stories – tomorrow! Today was our final day in Churchill. It always seems to come to a close too quickly. As we ventured out, another group arrived to take our place at the Studies Center. Depending on the weather, it’s possible the bears will only be on land for another few days or a week before the ice freezes and they’re able to commence their hunting and feeding season. When we were reunited with our peers last night, those of us who went on the tundra buggy yesterday learned that the rest of the group also experienced a magical day. They too were treated to a bear approaching the bus in close proximity and a display of bears sparring just off the side of the road. And, of course, the candlestick sunset was in view to all those who were fortunate enough to be outside last night. 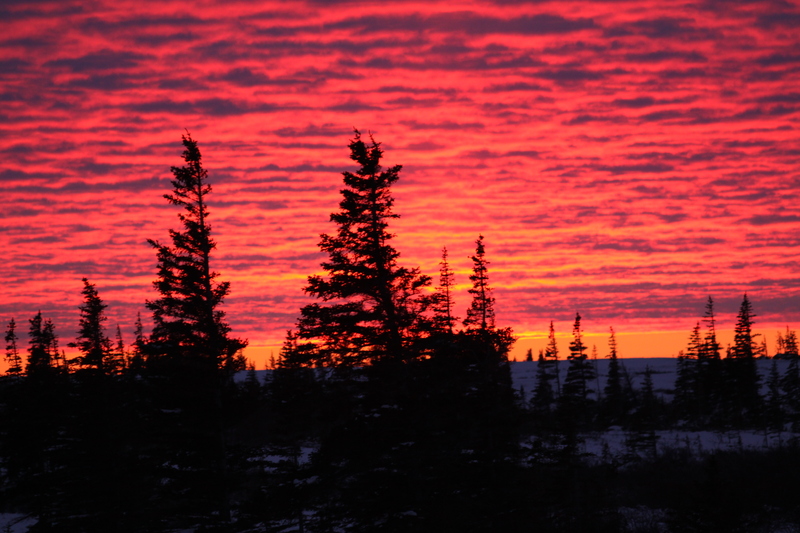 Unobstructed by large buildings and developments, Churchill sunsets are spectacular and seem to overtake the entire skyline, not just the West coast. Another bear visited us at the Studies Center last night. Most of us were upstairs for the evening’s class and did not see the bear. However, a few members of our group, too tired to focus on the evening’s lessons, were resting in the quiet lounge and were again surprised by a bear that pressed its face up against the window. J.D, Logan, Deborah, and David notified Studies Center staff about the bear and were able to capture a few pictures before the bear was scared off once more. I saw some of the pictures and if any are emailed to me, I’ll post them here. Again, the zoo imagery struck me with irony. Although Studies Center staff couldn’t allow the bear to remain in such close proximity, I was happy we got to experience the feeling of being locked behind bars while a large, potentially dangerous creature observed us curiously. We saw a few bears today, including another that walked right up to the window of our bus. The bear got so close that we were instructed to close our windows. After some bear observations, we pulled off the side of the road to build an igloo. 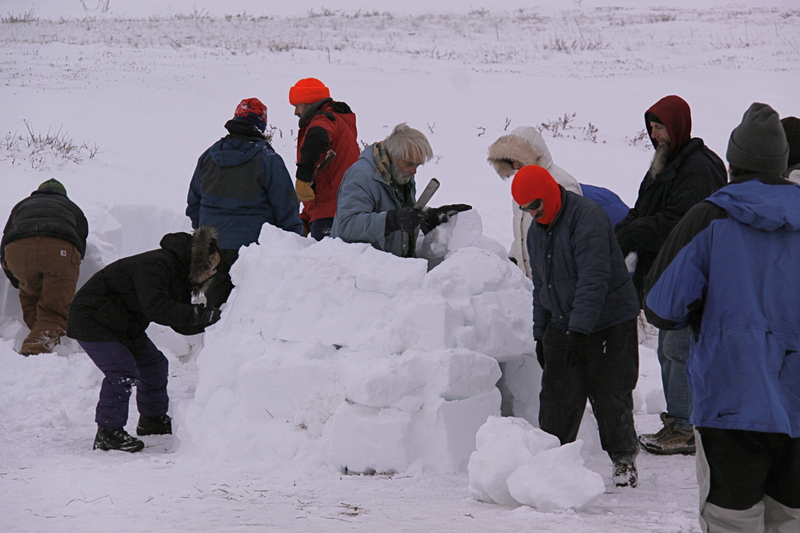 Chuck instructed us about how to cut and stack the ice to create the igloo structure. Once built, we took turns crawling inside the igloo to get a sense of the warmth and cover it offered from the elements. Chuck told a story about an igloo he built a couple years ago. He said that it was so cold and stormy out that as soon as he completed the igloo an Arctic fox darted inside and curled up. It was noticeably colder today, with fog and snow drifting around us. We took a walk through the forest while Chuck pointed out the vegetation and various food sources it offers Arctic critters like hares and foxes. We picked and tasted crowberries. This forest outing was more pleasant than last year’s version that had us standing in 30 below temperatures, among several feet of snow. On our way back to the center we stopped by a crashed plane that remains untouched among the rocks and terrain of Churchill. The plane has been nicknamed “Miss Piggy” and ironically crashed in 1979 while carrying a large load of soda rumored to be Coca Cola (a company that adopted polar bears as its mascot) over the region. I’m not sure why the plane hasn’t been hauled away, but it’s quite a sight to see lodged among the rocks. We went back to the Studies Center, had a nice meal, and gathered our luggage. Our departure from the Studies Center was delayed briefly when, once again, we were visited by a polar bear. After the bear moved out of the area and we could safely leave the Center, we headed for the train station. We passed by our igloo on the way to the train station and pulled over to have another look. It was dark outside so Chuck crawled inside the igloo and illuminated it with a flashlight so we could get a sense of how it would look with a fire burning inside. 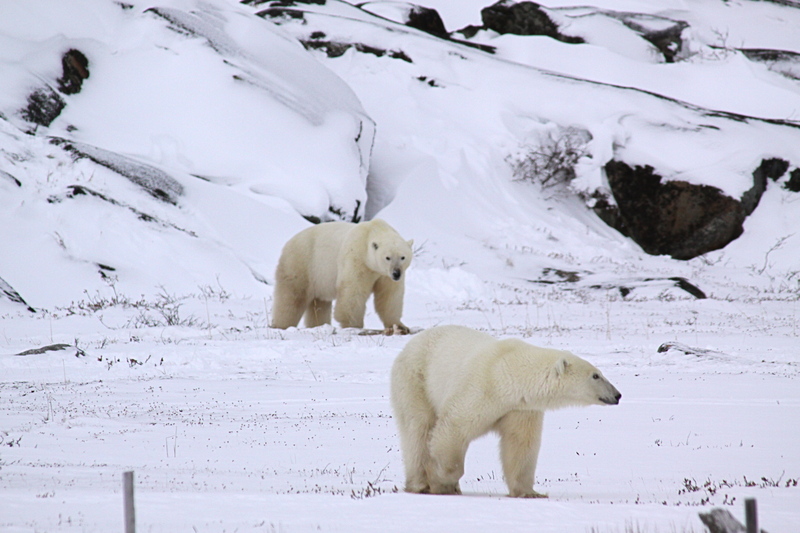 We boarded the train, most of us expressing sadness to be departing the wonder of Churchill and the polar bears. I was heartbroken to be leaving. 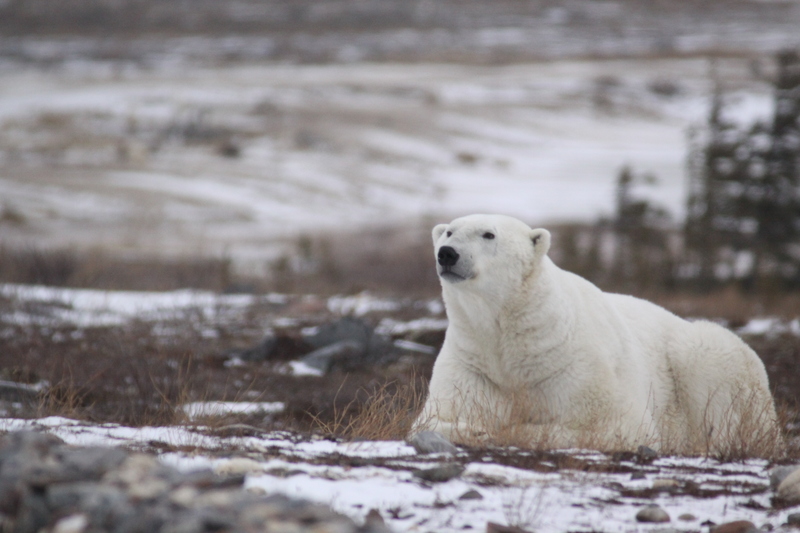 Throughout the duration of our stay, we learned more about the political issues in Churchill that make it difficult to further protect the bears and prosecute some of the unscrupulous people that are exploiting them. 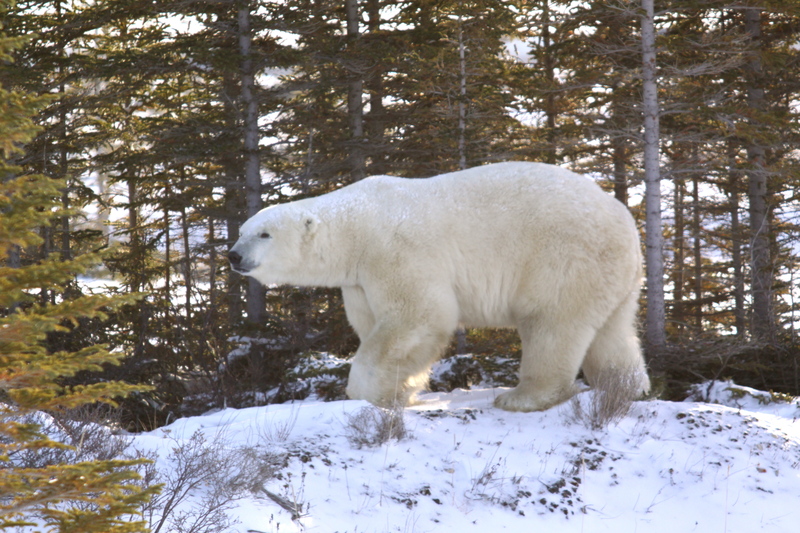 Tourism generated by people wanting to see the polar bears is the primary source of revenue for the town, so people are resistant to further regulate tour operations. 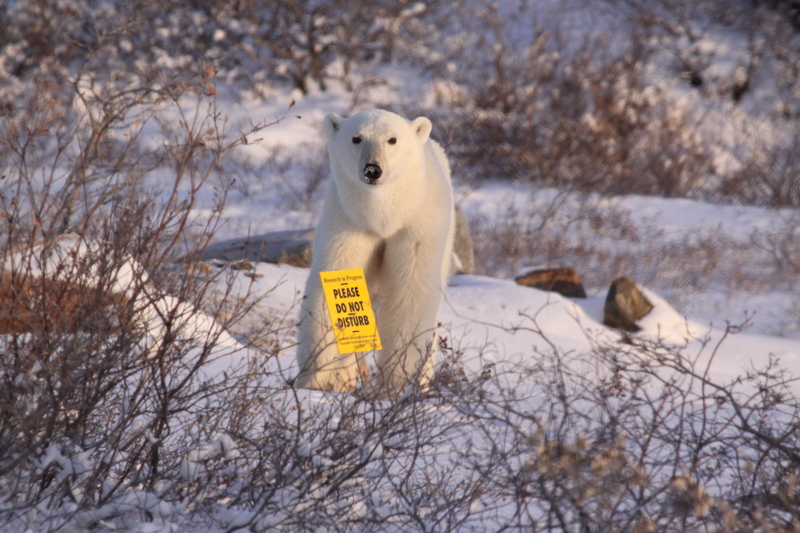 There’s a lot that needs to be done for the polar bears of Churchill, both locally and globally. There are initiatives I’d like to become more involved in, some that are more challenging to take on from a distance. 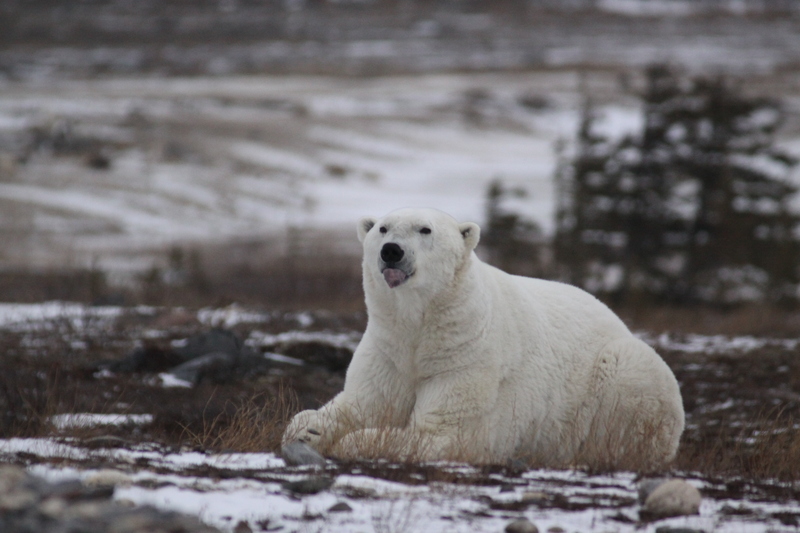 Having witnessed the corruption of some tour operators and photographers, I began contemplating what it would be like if all humans left the Churchill area and let polar bears live undisturbed. The bears would still face the threats of our global impact on the Arctic region, but it seems several unnecessary day-to-day stresses would be eliminated without our presence on their land. On the flip-side, it could be argued that studying the bears is a necessary means to help sustain their population. 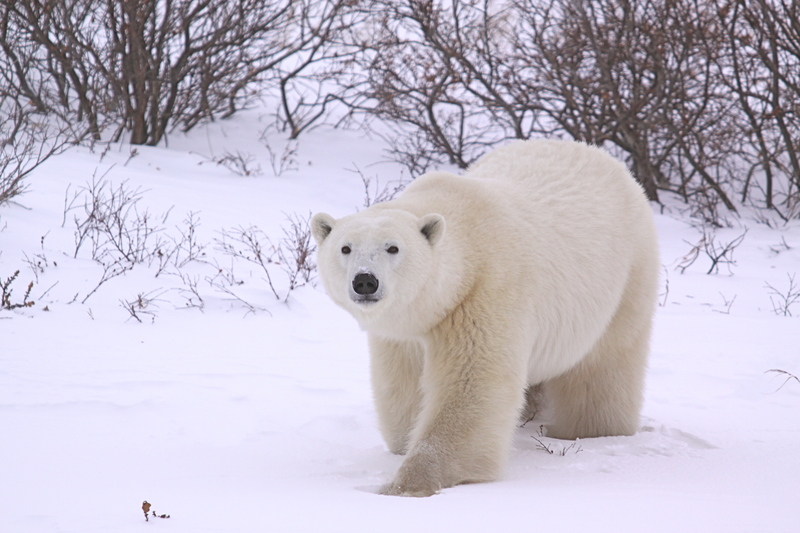 And I know from personal experience that my encounters with polar bears have sparked positive lifestyle changes in those I’ve shared stories with and those whom have read my blog. I certainly intend to make this annual journey for as long as the trip is offered and the bears are in existence. At the same time, I’d love to see some additional regulations implemented by the town of Churchill. Perhaps they could institute limited visitor permits, impose a tax on tour operators to accrue more funds to help study and sustain the bear population in the area, fine and prosecute those who bait bears for personal gain and profit . . . The vivid dream I had that sparked my initial Arctic expedition one year ago involved an interaction with the last polar bear on Earth. 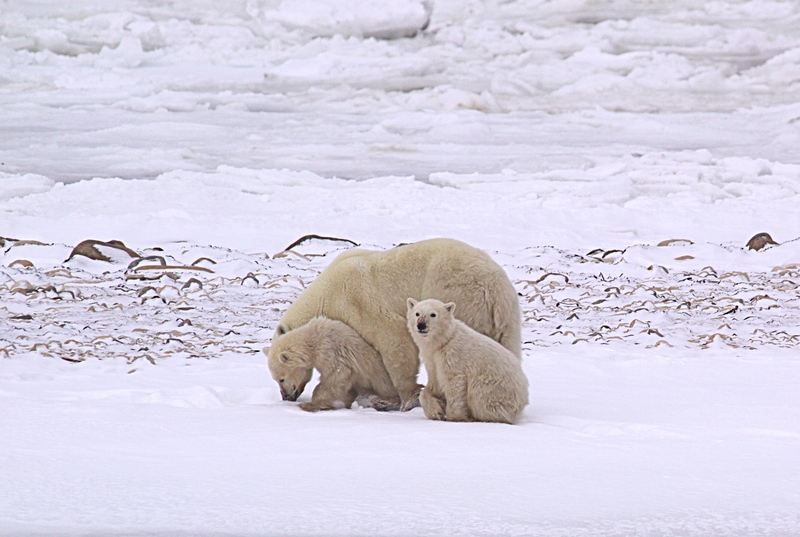 He was sitting on the last piece of remaining ice, looking at me as if to say, “What are you going to do?” As I looked into the eyes of the polar bears we encountered during this year’s journey, I saw them asking the same question. I intend to become more informed about the local issues in Churchill. 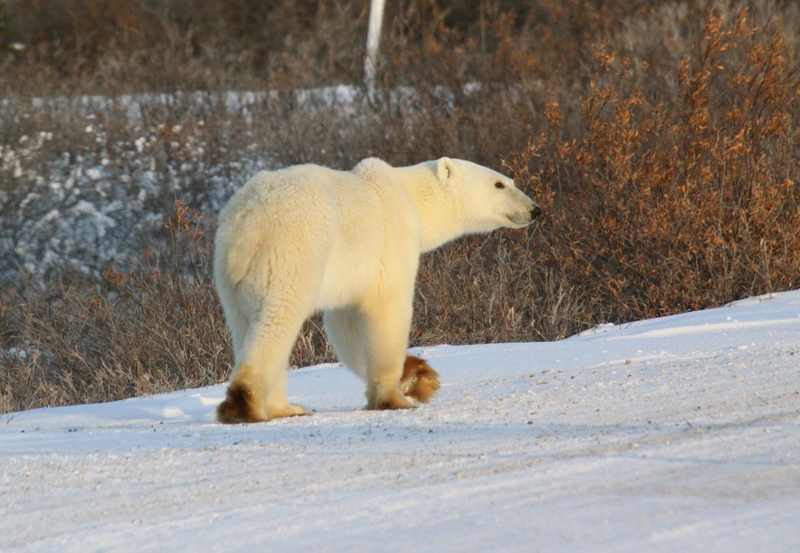 I intend to find out how, as the people bringing an influx of revenue-generating business to the area, we can further influence additional changes to help protect the polar bear population in Churchill. I am also committed to further personal lifestyle changes to minimize my impact on climate change, as well as becoming more informed and involved in the global issues that threaten the sustainability of the polar bear population. Last night a polar bear visited us at the Studies Center. Following dinner and preceding our evening lecture Shannon heard a loud knock at one of the side doors. The door leads outside from the quiet lounge area and is not used by visitors to the Center. This entrance is specifically used to load luggage in and out of the building. A new group of students was expected at the Center last night so when Shannon heard the knock at the door her first assumption was that a representative from the new group was at the door. Thankfully, before she considered opening the door Shannon thought aloud, “I wonder if there’s a bear out there . . .” Shannon’s statement prompted Jenny, a volunteer at the Great Bear Foundation, to look out the window. Sure enough, there was a large polar bear, standing upright, banging forcefully on the door. The bear made its way to a window in the quiet lounge and peered in at the guests who were gathering for an impromptu happy hour glass of wine. After satisfying its curiosity with that room, the bear walked around the building and pressed its face against the window of one of the dorm rooms. Our classmates Jeremy, Elissa, Steven, and Christina, were startled by the bear’s big face in their bedroom window. Within minutes the Studies Center staff scared the bear away by firing flares into the sky. 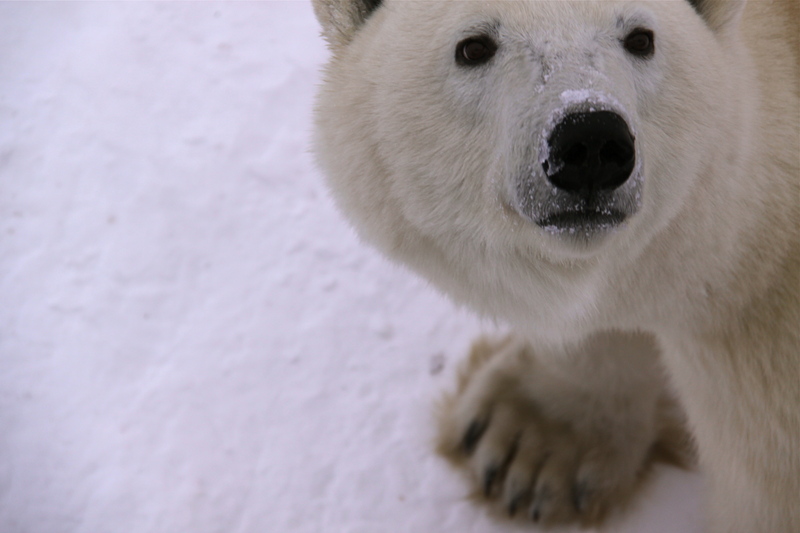 For me, this close encounter with a polar bear at the Studies Center sparked images of the zoo. In this case, we humans were in a building, behind windows secured with bars, as polar bears looked in at us with curiosity. It seemed a fitting display of karma, and while safety is imperative, I was happy that we were all reminded of our place in Churchill. 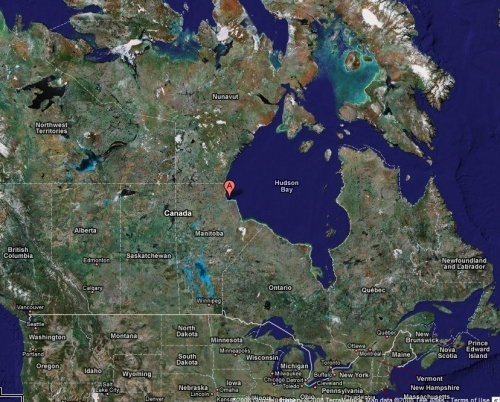 This is the polar bear’s home, they have the upper-hand here – we are the strange alien creatures in their land. This morning approximately half our group (myself included) set out on a Tundra Buggy to get a closer look at the bears. I have mixed feelings about the buggies. 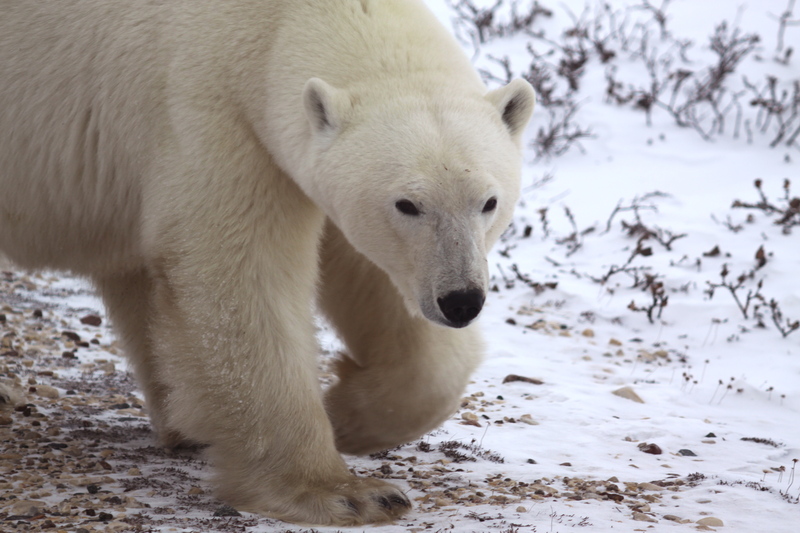 Their impact on the tundra is a hot topic and disputed from both advocates and protesters. At the same time, the buggies potentially allow us to get closer to the bears and observe more of their natural behavior. This year we’ve been fortunate to have many close encounters with bears right off the main publicly accessible roads in Churchill. I considered giving up my space on the buggy, but I’m happy I maintained it. From the buggy we saw 5 different sets of moms with cubs ranging in age from 10 months to two years old. The first mom we saw was walking with her male cub that was almost the same size his mom. 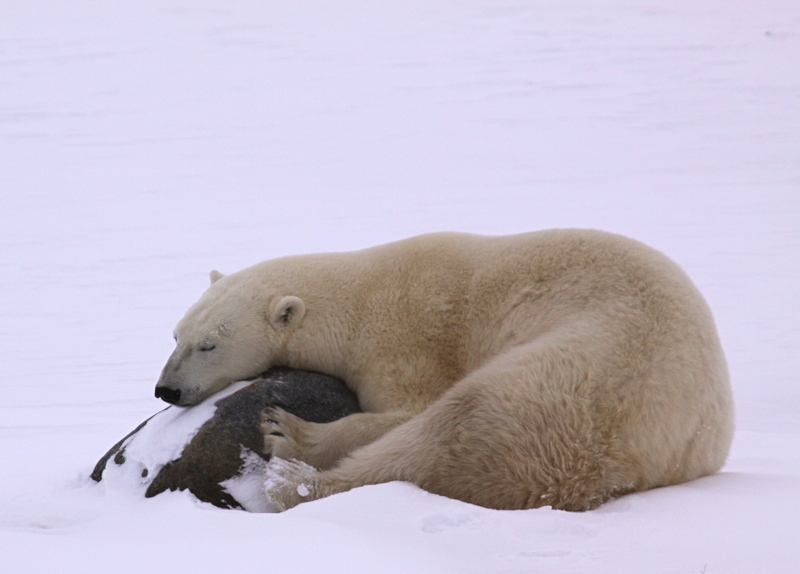 Once she assessed the area and felt her cub was safe, the mom found a rock to use as a pillow and rested comfortably. Meanwhile, the curious young cub made his way up to our buggy. I had my telephoto lens on, so at a certain point the bear was too close to photograph. This was actually a blessing – it allowed me to put the camera down and observe the bear through the open window and the back deck. On several occasions the bear made his way toward me on the buggy and looked at me with curious, sweet eyes. I feel a deep connection with the bears, an understanding, and an unspoken communication. Their eyes share a story of vulnerability and playfulness. In these moments it’s important to remember their sheer strength and power. One look at a 900-pound bear crossing the ice serves as a quick reminder that any encounter closer than the one we were experiencing could be deadly. After inspecting the buggy from all angles, the cub made its way back to his mother and rested by her side. Just as were about to pull away and continue down the path, we saw 2 bears that had previously been resting approach each other. “It looks like we might see some sparring,” our buggy guide J.P. noted. He turned the vehicle off and we observed the sparring bears for what seemed to be at least half an hour. Sparring is a natural play-fighting that allows the bears to practice for the real battles they face during mating season. 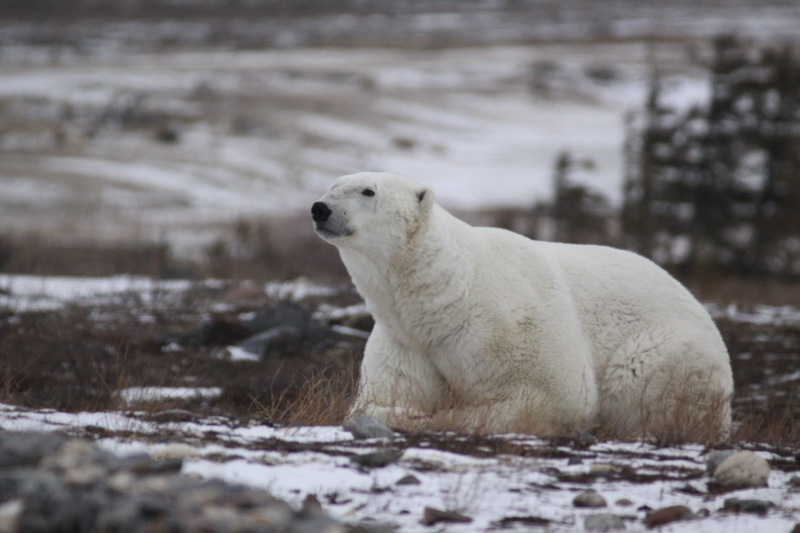 Male bears in Churchill outnumber female bears by an estimated ratio of 3 to 1, so often males need to fight for mating rights. The 2 bears sparred for a while and then a third bear approached. All 3 bears circled each other, assessing another sparring match. 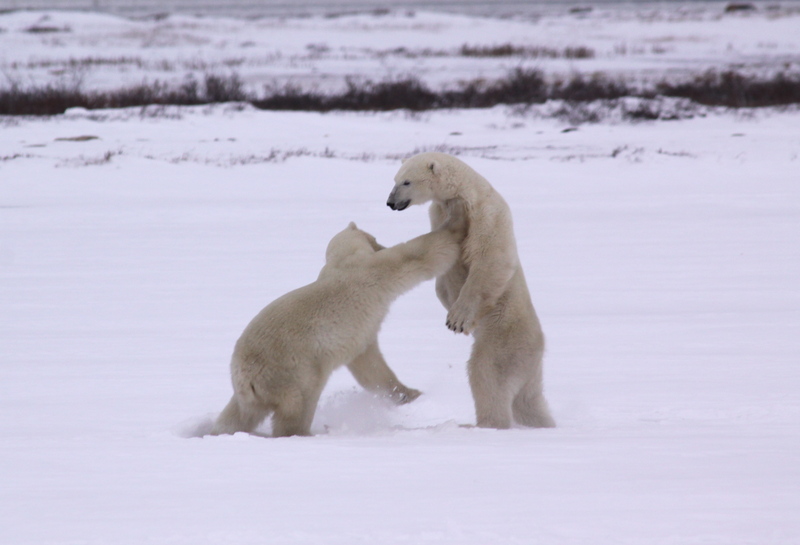 2 bears – one that fought previously and the new bear – engaged in another round of sparring. The third bear, tired from the first match, made its way to our vehicle and inspected us curiously. approached us from the other direction. 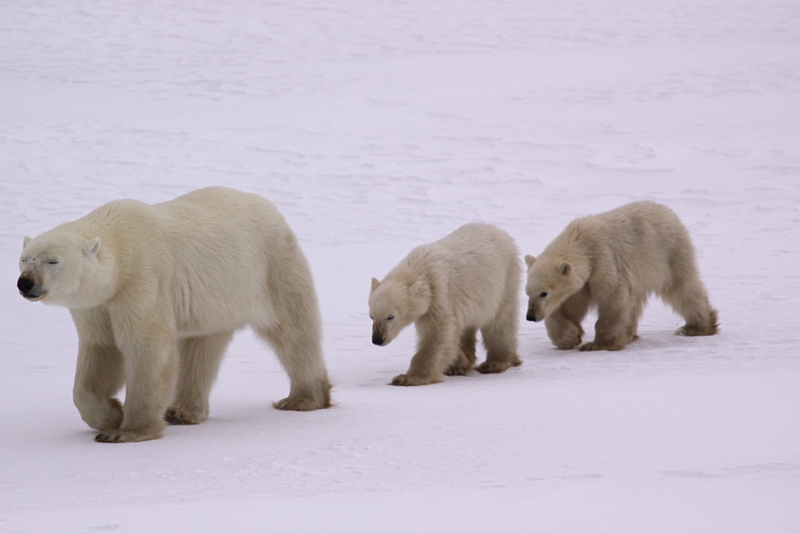 The cubs were born in January and walked in a single-file line behind their mother. A male bear was following them at a distance. Hungry male bears will attack and eat cubs, so the mom was moving her cubs swiftly to safety. Once the mom and cubs got a safe distance from the male, she laid back on the ice and we watched as she nursed the young cubs. We counted our blessings again as it’s rare to observe nursing behavior. yoga. He was extremely flexible, pulling his back legs over his stomach and up toward his mouth. He looked at us as if he knew were taking pictures and he was hamming it up for the cameras. As people cooed about how “cute” the bear was, we were once again reminded of his power. 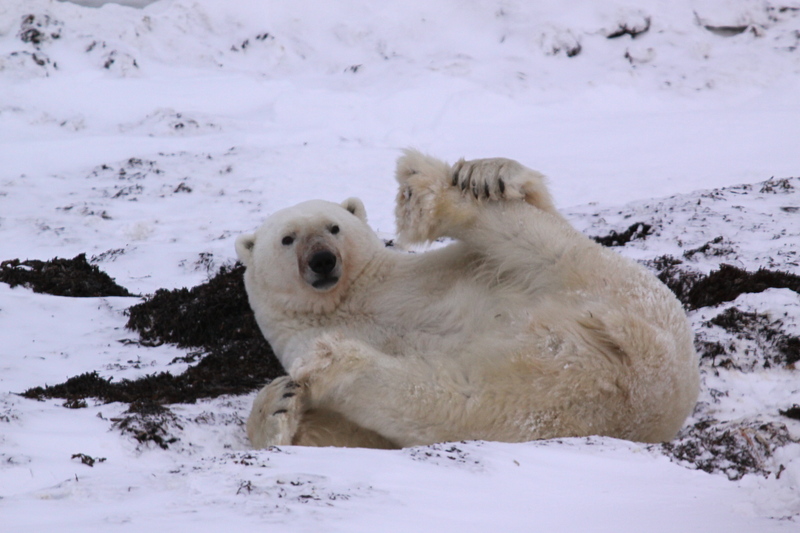 After another half hour of playful stretching and tumbling, the bear sat up. When he arose, back to us, we could see the battle scars from fights during the years. J.P. estimated that the large male was 6 to 7 years old. It’s almost as if our “cute” bear friend wanted to remind us of his size and power, being sure to sit up before we pulled away. We saw several bears resting; other younger bears were out testing the ice. We watched as one bear hopped from one block of ice to another and practiced thumping the ice with its two front paws. Another mom with two slightly older cubs approached us as we made our way back to town. Again, the bears were too close to photograph. I spoke softly to the bears as they approached me on the buggy. Then I heard J.P., “look at that sunset!” We turned our attention away from the bears and saw an exquisite sunset. I’ve seen a lot of beautiful sunsets throughout my travels and at home over the Santa Monica ocean, but this sunset with its beam of light radiating from vertically from the horizon through the sky was the most magnificent sunset I’ve seen. 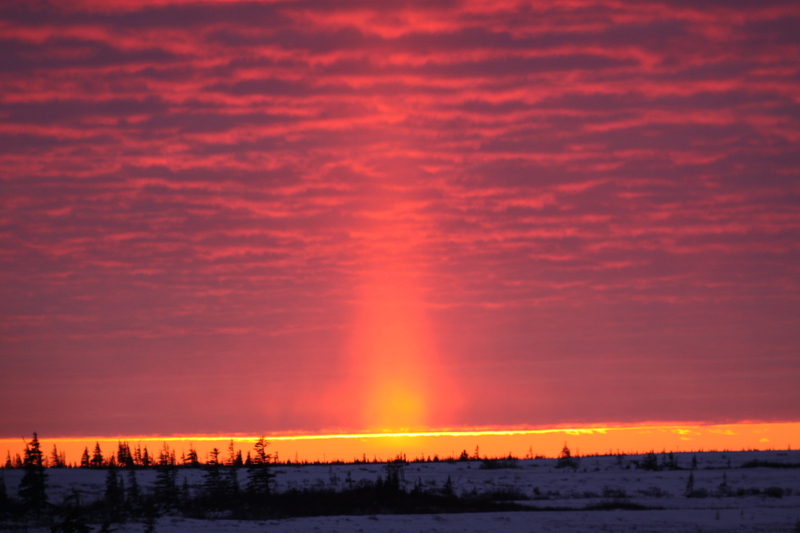 Later I learned that this type of sunset is often referred to as a candlestick sunset and is quite common in the North. 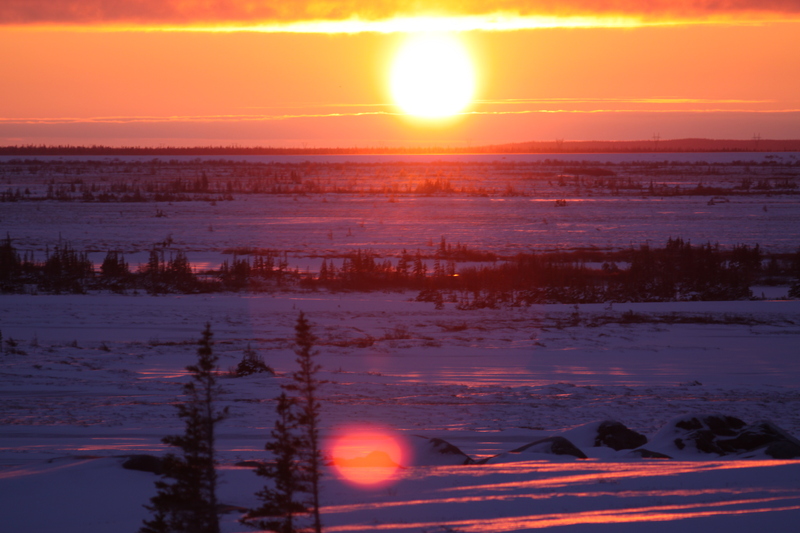 As with the magical bear, fox, sunset, Arctic hare day that preceded today, tonight’s sunset punctuated another perfect day. As with last year, there’s a tribe of people who gather in the kitchen with whiskey and beer after the day’s adventures and classes have concluded. It’s a convergence of two different groups of students and biologists, sharing bear stories, ghost stories, and exchanging ideas to make positive change. The late night kitchen gathering is one of my favorite parts of this annual adventure (yes, I will be back every year) and I find it hard to tear myself away during the early morning hours. It’s even harder to get away when excusing yourself leads to group protests and pleas to stay for “just one more story.” Eventually, one by one, we make our way to bed between 1:00am and 4:00am and before you know it, the alarm is going off to signal another day of Arctic adventures. We continued to make our way to Cape Merry, spotting bears and observing their behavior. We also noticed that more sea ice had accumulated in the bay overnight. Chuck told us that with a few more nights below freezing the ice would solidify and the bears would be able to go out and hunt again. 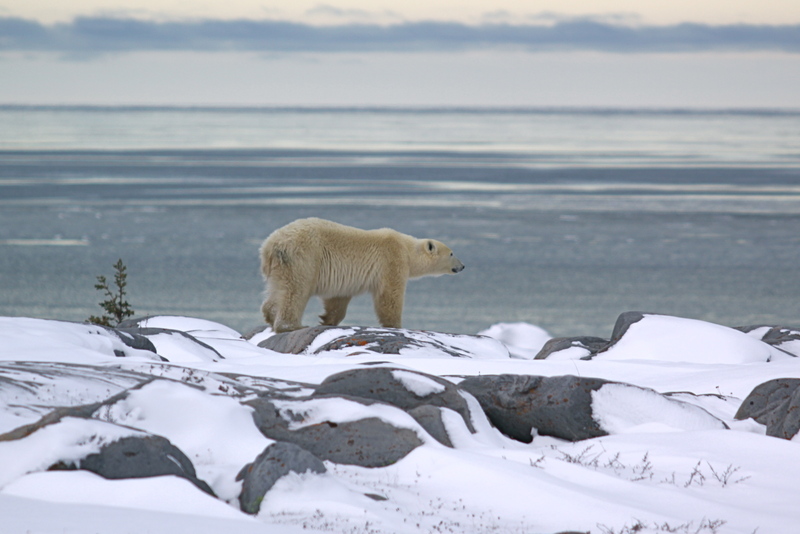 We saw several bears along the coast, looking at the water as if they were willing it to freeze. We saw quite a few bears along the way to Cape Merry and it was a beautiful, sunny day. One bear was sleeping in a patch of willows close to the side of the road. There were several trucks that pulled over to watch the bear. Seemingly aware that he was under observation, the bear stood up purposefully, looked at us and crossed the road. Why did the polar bear cross the street? To get some rest. Once safely on the other side of the road, the bear traversed down a little hill and laid down, barely within view. One by one the trucks of onlookers pulled away. tracks we saw. Just as everybody succumbed to the idea that the foxes around Cape Merry were out of view, a little white Arctic fox appeared on the side of a hill. The fox made its way up the hill as we pulled over once again to watch it. We all reached for our cameras and got some great pictures of the fox, backlit, on top of the hill. 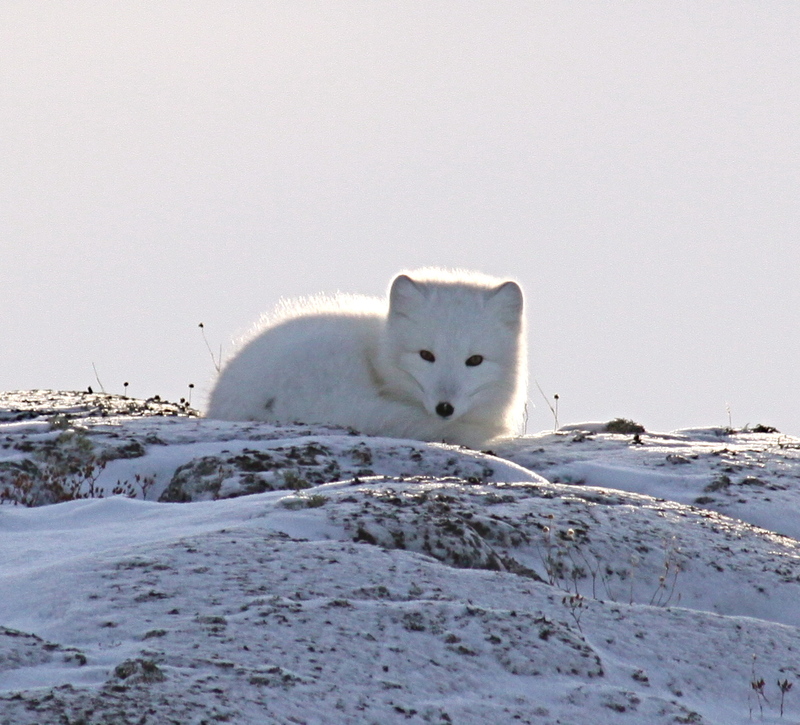 Arctic foxes always appear joyous, as they seem to bounce around the snow and rocks. When you actually do see an Arctic fox it’s as if the fox knows you’re taking pictures and it provides picture perfect poses in the best light of day. We continued making our way out of Cape Merry until somebody spotted another fox coming down a hill. This time it was a cross fox – a mix between a silver fox and a red fox. The dark, multi-colored fox was digging and burying its nose in the snow. 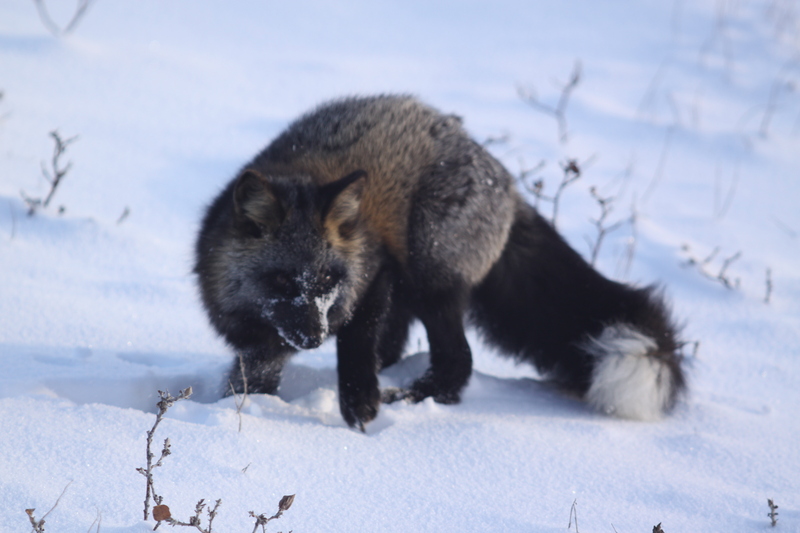 Then, the cross fox looked up at us, nose covered in snow, and made its way toward our bus. The fox observed us curiously before running off alongside the hill again. “fox!” Once again, we pulled over to have a look. This time it was a beautiful red fox, curled up asleep on the rocks. We all expressed our gratitude and feelings of being blessed with several fox sightings. Not only did we see 3 foxes today, we saw 3 different kinds of foxes. We made our way back to the Studies Center and felt satisfied, having seen at least 10 polar bears and 3 foxes in one day. After dinner and our evening lecture, Frank told us that if the Northern Lights were out tonight, he’d take us to see them. Sure enough, around 11:00pm we got word that the Northern Lights were visible. Those of us who were awake boarded the bus and drove approximately one mile, away from the light of the Studies Center to see the Lights. 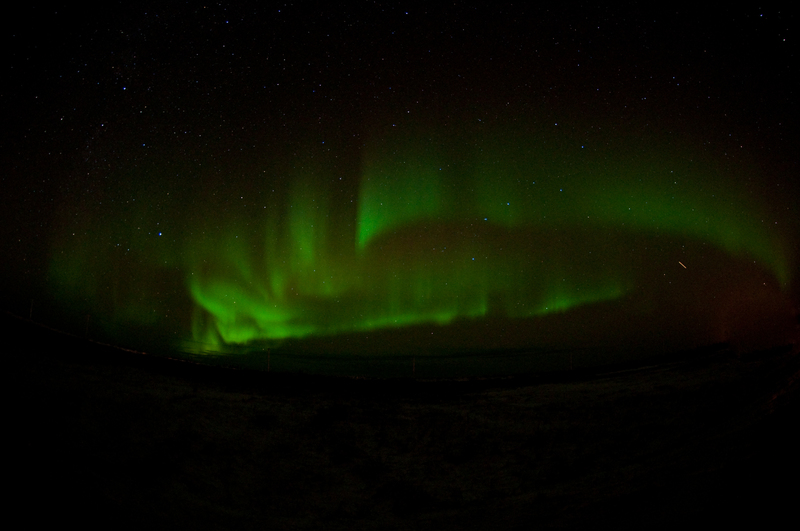 We were awestruck as we watched the Northern Lights display. The green light morphed and shape-shifted, at times appearing to cover the entire sky, all the way down to the horizon. In line with our perfect, magical day, we saw 3 shooting stars among the Northern Lights. As the lights faded and the display subsided, we boarded the bus and made our way back to the Studies Center. Just prior to pulling into the parking lot, an Arctic hare hopped right across our path – a magic rabbit to bookend a perfect day.